ADDED PERFORMANCES "Skin Tight" (Cor Theatre): Two People Melded Together Inside Out! "Sweet and Sad" (Profiles Theatre): Cast is Perfect in Human Imperfection! "Idomeneus" (Sideshow Theatre): This King Rules! "The Fall of the House of Usher" (The Hypocrites): Continues the Rise of the Era of Graney! 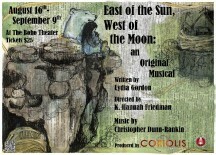 "East of the Sun,West of the Moon" (Coriolis Theatre): Singing is Noteworthy! Off Book Chats Up Vitalist, Chicago Fringe, Redtwist, Muse of Fire and More!